Many deer find their way onto highways and into suburban neighborhoods during the autumn season. Both parties lose when car and deer collide, but a measure of defensive driving can reduce the risks. According to the Insurance Information Institute, during deer season, which generally runs from October through December, there is a dramatic increase in the movement of the deer population. CARSTAR says that while the frequency of deer-related accidents is decreasing, the severity of these accidents is increasing because modern vehicles are filled with advanced technologies that need repairing. One out of 167 drivers will have a claim from a deer, elk, moose or caribou collision in 2018, according to State Farm, which is an improvement from the 2017 odds of one in 162. Those odds more than double during October, November and December, and there is an increased risk around dawn and dusk. State Farm estimates that animal collisions dropped slightly to 1.33 million between July 1, 2017 and June 30, 2018, compared with 1.34 million for the same period the previous year. 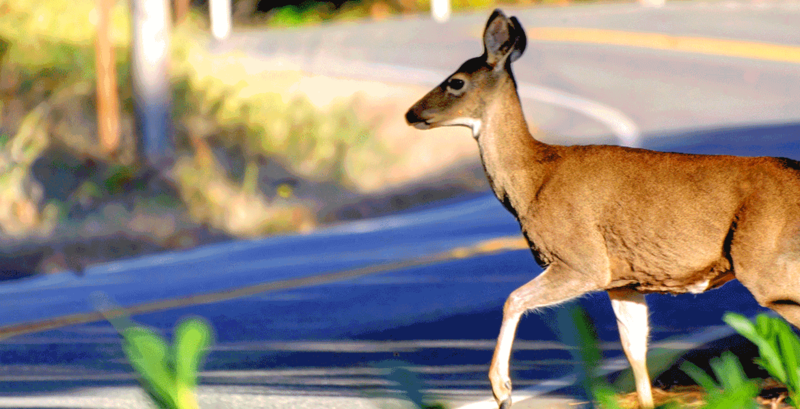 This year, some 1.33 million drivers will hit a deer, and November is the peak month for deer-related accidents. But drivers can avoid an accident with a buck by following some smart driving tips this fall and winter. Early morning and dusk are the worst times for deer accidents, as visibility is limited and deer are frequently on the move. It is important to drive defensively and anticipate the potential for deer in the road. Use extra caution at dawn and dusk as well as around golf courses, fields and wooded areas. Do not swerve to avoid striking a deer, as that increases the risk of hitting another vehicle or losing control of the car. Do not rely on devices such as deer whistles to scare off animals. If a deer remains on the highway after you strike it, report the incident to the game commission or a local law enforcement agency, as it can pose a danger to other motorists. If the deer is still alive, do not go near it because a wild animal with sharp hooves can inflict injuries. If an accident with a deer does occur, it pays to be protected. Many drivers do not realize that carrying only collision coverage does not cover damage from a deer accident, leaving them with a damaged vehicle and a large repair bill. To cover any potential damage, drivers should carry comprehensive insurance that covers such collisions. For those driving an older vehicle who feel their cars aren’t worth the cost of the insurance, it is smart to keep an “accident fund” if something does occur. If a driver ends up stranded with a damaged vehicle after a deer collision, they can always call 1-800-CARSTAR. CARSTAR will send a tow truck, call the driver’s insurance company, arrange for a rental car and repair the vehicle. For more information and store locations, visit www.CARSTAR.com.